Applications for the Belfast Pride Parade 2019 will open soon, below if everything you need to know about taking part as a community group, organisation, union or business. We are continuing to work with the Parades Commission to secure the necessary permit as the parade, like all parades here, is subject to parading law. The law on parades and the guidance from the Parades Commission have not changed and there are no plans to change it. When: Saturday 3rd August at 1.00pm with the parade build up starting from 11.30am. The festival : Belfast Pride Festival is one of the biggest festivals in Belfast and runs over 100 events across 10 days. The festival runs from Friday 26th July and will run to Sunday 4th August with Pride Day and the centrepiece Pride Parade on Saturday 3rd August. The Parade : The Belfast Pride Parade is the biggest cross community parade in Belfast and the single biggest parade in the city, the main event in the LGBT+ calendar and the one of the key events in Belfast Pride festival. It is a protest and a celebration, a call for equality, a stand for solidarity and a celebration of the lives of LGBT people in Belfast and is about LGBT messages and expressing support for LGBT people and we ask everyone taking part to respect this. The Route: The parade leaves at 1.00pm. 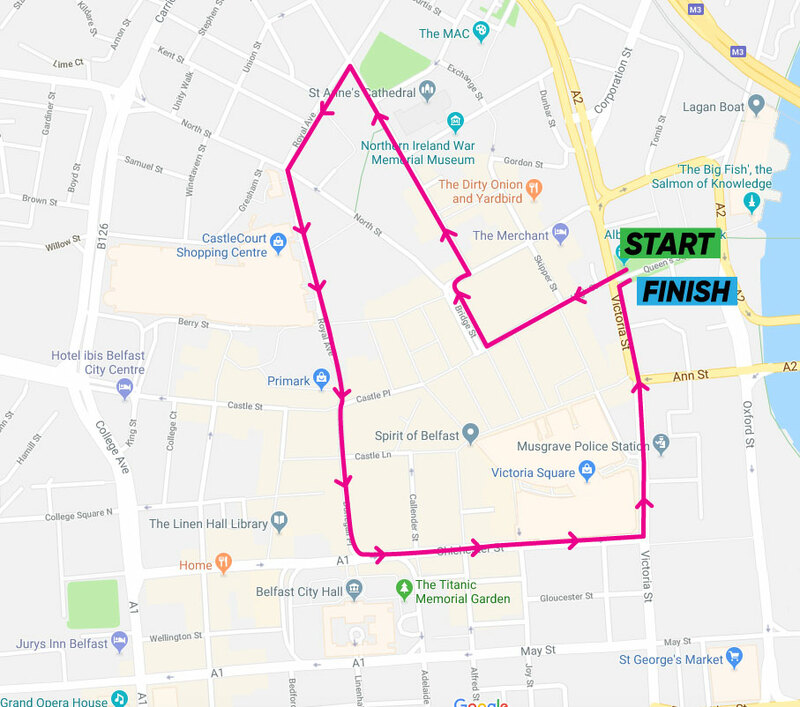 The route for Belfast Pride Parade 2019 is being reviewed – we introduced a new route for 2018 and outgrew this due to the huge numbers taking part last year and we aim to find the best way to fit everyone in, keep everyone safe and still get maximum Visibility. Finish. Floats continue on to Donegall Quay. 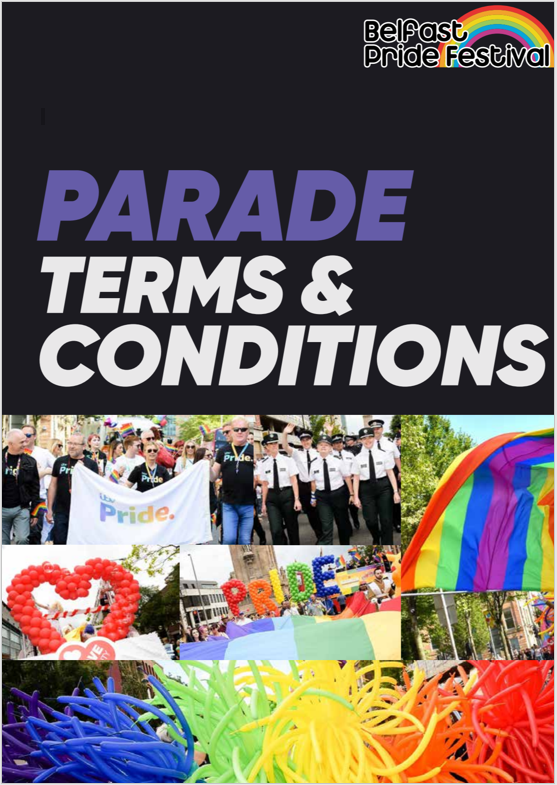 The rules: All parades in Belfast and anyone who takes part in a parade is subject to the Parades Commission’s Code of Conduct which is laid down in the Public Processions (NI) Act 1998. These are legally enforceable Guidelines and breaches can lead to prosecution. 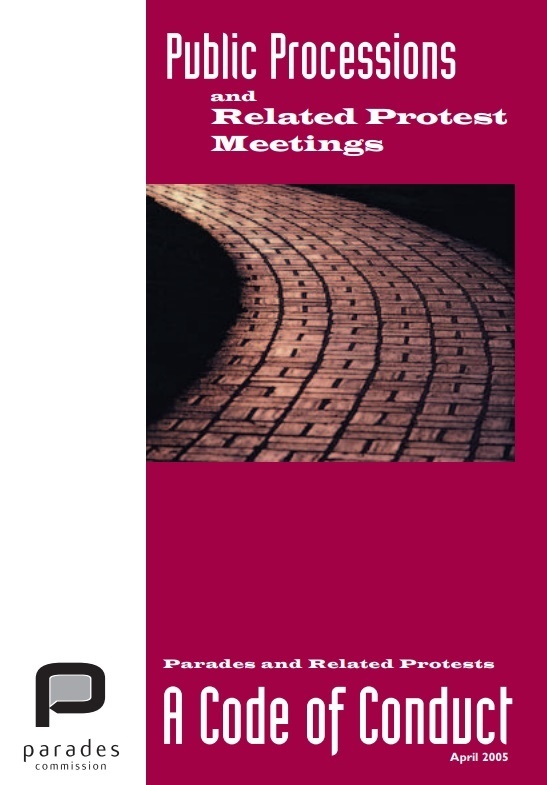 This type of law and its application to Pride parades is unique to Northern Ireland and it is a legacy of the Peace Process and governs parades and marches of any type or size. We think that this makes us the most legally regulated Pride parade in Western Europe and yet we are in the jurisdiction in Western Europe where LGBTQ people have the fewest rights, however, this law applies to everyone in the parade and we have no choice but to follow this. Who should make an application: All organised groups, organisations and businesses must apply and register individually so that we can ensure that the parade complies with the legislation, the Terms and Conditions and any additional advice from the PSNI and Belfast City Council on crowd safety and management. Individuals and groups of friends etc. do not register and can simply join in but law applies to everyone taking part – the actions of even one person could affect fut . Each group or organisation or any group with separate branding to another, should apply separately, umbrella group applications can’t be accepted for safety and security reasons. Applications from multiple groups submitted as one application will be rejected. You will asked to study the Parade Terms and Conditions, sign on behalf of your group to say that you will comply and attend a mandatory training session. Promotional materials: Belfast City Council rules on Litter mean that participants on the Belfast Pride Parade cannot distribute flyers, business cards, balloons, flags, badges or any other promotional items – so remember not to include this in your plans. You can promote your group at our Pride Village event, see that page for details. The fees: Belfast Pride is a charity that exists to deliver Belfast Pride Festival, we raise the full cost of the festival each year and pay fees and costs to deliver our free events. We have significant overheads to ensure that we have a safe parade and festival and we ask groups to help us contribute to these. The costs include professional mandatory Security staff, crowd safety costs, high visibility clothing for stewards and volunteers, fencing, cleansing and Insurance – all of which make the parade and surrounding events safe for crowds, participants and spectators. We also aim to use a proportion of the fees to improve the parade overall and make it an even better experience. Belfast Pride is a community effort and everyone should play their part to make it the best it could be – part of this is making a reasonable contribution to what a major events costs these days. Belfast Pride tries to deliver a lot on a lot less funding than you would expect, so we ask you to play your part an help towards these costs. Each parade entry must have a Lead Marshall who will be the main contact during the parade, each entry will also have to have a Marshall for each additional ten people on the entry. Marshalls are responsible for the safety and conduct of your entry and contribute to the crowd control and safety operation for the parade – they are not part of the parade entry and must fulfill the safety and conduct role. All Marshalls need to wear official Belfast Pride branded Hi Viz safety wear at all times during the parade and this is an important part of the parade rules. The parade in 2018 was the biggest ever and the safety of everyone who takes part is key consideration in how we manage the parade on behalf of our community.